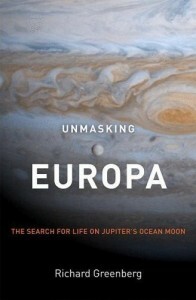 Unmasking Europa leads us through the unravelling of the mysteries of this intriguing Jovian moon, written by the expert who helped unlock many of its secrets. Richard Greenberg is a professor of planetary science and lead a team who interpreted the icy landforms and their controversial implications as they were revealed by the Galileo space probe. The landscapes of Europa are magnificently diverse: craters, cracks, ridges, and curious patches of jumbled terrain called chaos, all of which speak of on-going active processes in this moon. Europa seems to be a fervently active place, recycling its surface more rapidly than even that of our own world. The key to understanding Europa, its structure and evolution over the history of the solar system, Greenberg explains, is in understanding the powerful, constantly-shifting, tidal forces flexing through Europa from Jupiter’s powerful gravitation. These crack the icy surface and drive frictional heating to melt the moon’s interior. Galileo discovered that Europa isn’t just an icy moon, it is a water world hosting a deep global ocean hidden beneath its frozen face. But this book also recounts the fierce friction between the personalities leading the Galileo mission and publishing their interpretations of what they saw. The central controversy is whether Europa’s ocean is entombed deep beneath a thick ice layer, or if the ice shell is thin enough for the ocean to regularly come into contact with the surface. This is crucial to not only piecing together the history of the moon, but also the possibility of Europan life. Greenberg’s argument for thin ice has reportedly seen him ostracised by the Europa community and he does not hide the bitterness harboured at his treatment. This does get wearing after 270 pages, but the story-telling is first-rate and elegantly explains not just the processes at work on this intriguing little world but also the rivalries and political manoeuvring of Big Science. Of specific interest to astrobiologists are the final chapters, where Greenberg deals with the possibility of a Europan biosphere and future exploration programmes planned for this icy moon. The most vitally important aspect for the possibility of dark oceanic life is the thickness of Europa’s icy shell. With no sunlight penetrating into the cold depths photosynthesis is not available as a power source for life, and ecosystems must instead fuel themselves chemosynthetically – by running redox reactions between suitable dissolved chemicals. In an isolated environment like a trapped ocean the supply of oxidants is probably severely limiting. But an icy shell that is relatively thin and regularly melts-through would periodically flood life-supporting oxidants into the ocean below. So the very root of the fierce argument between opposing camps of planetary scientists reported by Greenberg is exactly what may determine the survival of Europan life. Unmasking Europa is a gripping story of the exploration of a new world and the often heated debates within science, and is absolutely stuffed with gorgeous images of strange Europan landscapes.